It hits you all of a sudden – that unexpected tummy rumbling and discomfort. Before you know it, you’re making a beeline for the nearest bathroom, hoping that no one is paying attention as you shuffle along. If you’re lucky, you only have one bout of it. However, if you’re ill with a stomach bug or have a more permanent gastrointestinal issue, you might find yourself in a bit of a quandary over what to eat. Since diarrhea and food are inextricably linked, it is best to know which foods you should eat and which ones you should avoid altogether. 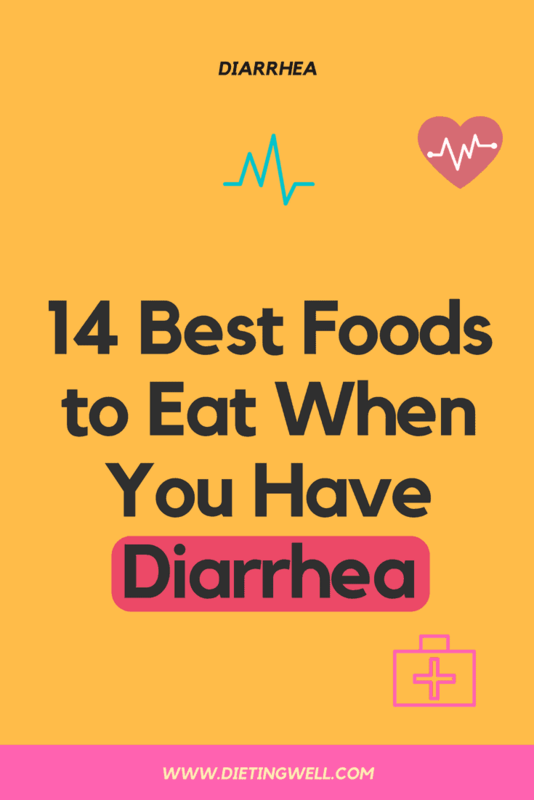 When you develop diarrhea, it is sometimes difficult to know which foods you should stay away from. It can often seem like anything will cause diarrhea. The truth is, some foods trigger gastrointestinal upset much more easily than others. When you get diarrhea, make sure that you stay hydrated by drinking water, coconut water, or bone broth. Additionally, you should take it easy on your digestive system by eating smaller but more frequent meals. Eating regular-sized portions adds a lot of unnecessary stress on your digestive tract and can make diarrhea worse. You have probably heard doctors say that going on the “BRAT” diet is one of your best options when you are dealing with diarrhea. As you’ve probably been informed, “BRAT” stands for “Bananas, Rice, Applesauce, and Toast” and is also called the “Bland Food Diet”. Bananas (especially ripened, fully yellow ones) are great to eat if you’re struggling with diarrhea. Although they come packed with fiber and other essential nutrients (like potassium, an electrolyte commonly lost when you experience diarrhea), bananas are relatively bland. This means that they won’t upset your digestive tract as it recovers from whatever ailment is causing diarrhea. When it comes to curbing diarrhea, rice is also extremely effective. However, not just any type of rice will do. It is generally recommended that you eat white rice as opposed to brown rice. This is due to the fact that brown rice is not milled like white rice and still contains bran. White rice is actually white because it is milled, which strips it of its bran. Bran contains a lot of phytic acids, which can make gastrointestinal and digestive issues even worse. Basmati and Jasmine are both types of white rice that have distinct aromas and taste great in many meals. Applesauce is another tried-and-true food for getting rid of diarrhea from a strain of the flu. When paired with cinnamon or (even better) carob, applesauce can help bind you up. Applesauce contains a substance called pectin, which works to stabilize food and actually increases your stool’s volume. Carob is a nice addition since this sweet alternative to chocolate (which is available in powder form) is rich in antioxidants and fiber, is low in sugar, and is naturally gluten-free. Rounding out the “BRAT” diet is toast. Toast is generally pretty bland as long as you don’t add butter or jam. Of course, if you have gluten sensitivity or a wheat allergy, you should avoid bread and opt for something other than toast. White bread is typically the mildest form of bread. Multi-grain bread should be avoided when you’re ill with diarrhea since grains can trigger more gastrointestinal upset. You can opt for gluten-free bread as well, which is usually mild on the digestive tract. Since most doctors recommend you extend your diarrhea diet beyond the “BRAT” diet in order to get sufficient nutrients, probiotic yogurt can be helpful. Probiotics help to flush out toxins from the gut while introducing healthy gut bacteria. If you are vegan or cannot eat dairy-based yogurt, there are non-dairy yogurts that contain live cultures. These products tend to be soy, almond, or coconut-based. Almond and coconut-based yogurts are going to be the mildest on the stomach for anyone with diarrhea since they are both very alkaline. You probably did not expect to see kimchi on this list, but here it is! Kimchi is a popular Korean dish that usually includes cabbage. Cabbage works to promote healthy gut flora and is not a digested fiber, so it helps to keep bowel movements solid and regular. Any cabbage you consume is best when cooked if you are experiencing diarrhea. A word to the wise: Kimchi is spicy. If spicy foods trigger your diarrhea, you will want to avoid kimchi and find something that is a bit blander. Of course, if you are preparing kimchi from scratch, you can reduce the spice level as much as you desire. For those of you who are meat-eaters, you will want to avoid fatty and greasy meat products while you are dealing with diarrhea. However, you do not need to completely cut meat out of your diet while you’re battling diarrhea. In fact, you should be adding lean meats into your diet to help curb diarrhea and get some essential nutrients into your system. Lean meats like fish and chicken are much easier for your body to digest than red, fatty meats (which have been linked to colon cancer). If you are vegetarian or vegan, you can try consuming some well-cooked tofu in order to get a sufficient amount of protein. Protein is important since it gives your body energy to function properly and fight off infections. It also helps you feel less fatigued by replenishing your energy stores, which get drained when your immune system is striving to fight off an invading illness. Ginger is one of the most powerful and diverse spices. It comes from the root of the ginger plant, which is native to warm-weather climates (like Japan and India) but is grown throughout the world and used for medicinal purposes. Ginger has been shown to aid in the treatment of numerous digestive issues, including diarrhea and irritable bowel syndrome (IBS). It is considered safe for most people to take when orally consumed. It can be added to tea and mixes well with turmeric, which is also known to help relieve diarrhea. Adding low-fiber veggies to your diet that cause binding can help with diarrhea. Mushrooms are one such veggie. Of course, those with a mushroom intolerance should avoid eating them. However, shiitake mushrooms are usually considered safe for most people to eat when they have been properly grown, handled, and prepared. Mushrooms can easily be added to various dishes. In fact, mushrooms tend to go well with other low-fiber binding vegetables, such as carrots, green beans, asparagus tips, beets. They’re generally best to eat when cooked, which is a good rule-of-thumb for any vegetable you consume while you are having diarrhea. Also known as pepper squash, acorn squash is a type of winter squash that is frequently mistaken for a gourd. Acorn squash is easy to grow and is abundantly grown in North and Central America. There are multiple ways to prepare acorn squash, including baking, steaming, and sauteeing it. If you are able to tolerate white rice, acorn squash pairs well with it. In addition to containing a good amount of potassium and fiber, acorn squash also contains relatively decent amounts of vitamins B and C, manganese, and magnesium. Unlike other winter squashes, it is not rich in beta-carotene. Still, it is ideal for those dealing with diarrhea since it is alkaline and able to bind you up. While peanut butter can cause diarrhea in those with an intolerance or allergy to peanuts, in those who can eat it, peanut butter can cause binding. Peanuts have a good amount of dietary fiber and are high in protein, which is essential for those experiencing diarrhea. In addition to being packed with protein and having just enough fiber, peanut butter is a rich source of vitamins E and B6, manganese, magnesium, niacin, and pantothenic acid. It also has a moderate amount of potassium, which can help curb diarrhea. Those who can eat bread might want to consider adding some peanut butter to their toast to help it go down smoothly and taste a little less bland. Although they are far from being most people’s choice of veggies, green beans are an excellent source of nutrition when you are combatting diarrhea. They contain a sufficient amount of dietary fiber for those who are experiencing diarrhea. Also, they are low in fat and have a good amount of protein. Green beans are also packed with vitamins C and K. In terms of mineral content, green beans have a significant amount of calcium, magnesium, and potassium. Green beans are an extremely alkaline food and can easily be sauteed with coconut oil or dairy-free or lactose-free butter, which is easier on the digestive track than dairy-containing butter. Another vegetable that is excellent to eat if you are dealing with diarrhea is carrots. Carrots, which have been dubbed one of the world’s healthiest foods, are rich in beta carotene, vitamin A, vitamin K, vitamin B6, and niacin. They’re also packed with manganese and potassium. Since they’re a great source of pectin, carrots are ideal to eat when you have diarrhea. Pectin is a soluble fiber that increases the volume of your stool and viscosity. It is generally best to cook your carrots if you have diarrhea since eating too many raw carrots has been known to trigger stomach upset. Last, but certainly not least, we come to pretzels and crackers. For those who have no trouble digesting wheat products, these two foods can help stop diarrhea. When you experience diarrhea, your body loses many nutrients, including sodium. While you shouldn’t overdo it on salty chips, lightly salted pretzels and crackers can be helpful. Also, you should know that saltine crackers are low-fiber foods, so they will not run through you. If you can’t handle anything with whole grains while you are having diarrhea, you can try rice-based products, including rice crackers or products made from refined white flour. You can also find gluten-free crackers and pretzels at most grocery stores now, and these can be milder on the digestive tract. However, you will need to be diligent in checking labels since some products might contain milk or milk derivates that could cause an additional gastrointestinal upset. Even if you feel like you cannot keep anything in or have no appetite, it is imperative that you eat so that your body gets replenished with the vitamins and minerals it loses when you have diarrhea. Make sure that you stick with the blandest, most alkaline food possible. Avoid trigger foods until you feel like your digestive system has fully recovered. If your diarrhea continues regardless of what you eat, you should consider consulting your doctor. This could be a sign of a more deeply-rooted issue. Most diarrhea will clear up as your immune system wins its battle against the invading virus or bacteria. You can help your immune system by getting the necessary nutrients from a bland diet.